In a powerful testament to U.S. health improvements, the annual number of deaths in the country dropped by about 50,000 in 2004 — the largest such decline in more than 60 years. Drops in the death rates for heart disease, cancer and stroke accounted for most of the surprising development, health officials said. Overall, age-adjusted death rates fell to a record low of 801 deaths per 100,000 population in 2004, down from almost 833 deaths per 100,000 in 2003. "These are preliminary data," said Paul Terry, an assistant professor of epidemiology at Atlanta's Emory University. "But if it holds up, it's obviously very good news." The government also said Wednesday that U.S. life expectancy had inched up again, to a record high of 77.9 years. The preliminary mortality data, released by the National Center for Health Statistics, is based on a review of about 90 percent of the death records reported in all 50 states in 2004. A final report, based on a more complete review, is due later this year. 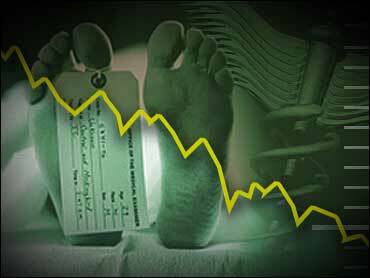 The preliminary total number of U.S. deaths recorded for 2004 was 2,398,343. That represents a 2 percent decline from the 2,448,288 recorded for 2003. The last decline in annual deaths occurred in 1997, a modest drop of 445 deaths from 1996, said Arialdi Minino, the statistician who is lead author of the report. The last drop in deaths of this magnitude occurred in 1944, when the number dropped about 48,000 from the previous year, he said. "We were surprised by the sharpness of the decrease (in 2004). It's kind of historical," Minino said. Health experts expect to see a slight rise in U.S. deaths each year, given the growth and aging of the U.S. population. To see such a giant drop after years of annual increases is a little hard to swallow, some said. "We will not make much of this until the final data come out," said Elizabeth Ward, director of surveillance research for the American Cancer Society. There was also some skepticism at the National Center for Health Statistics when they first saw the numbers, said Bob Anderson, the organization's chief of mortality statistics. "We were really kind of concerned about this when we first saw it, and wanted to make sure it was a real drop and not due to changes in data collection," he said. But the numbers were consistent across the country and were deemed solid enough to report, he added. The government also reported that a baby born in 2004 could expect to live to about 78. That's up from the 77.5-year life expectancy for 2003. Women now have a life expectancy of 80.4 years, up from 80.1 Male life expectancy is 75.2, up from 74.8. The life expectancy for whites — 78.3 — was up only slightly from the previous year. The increase for blacks was larger, rising to 73.3 from 72.7. The government also reported that the infant mortality rate has dropped to 6.76 per 1,000 births, down from 6.85 the year before. But there continues to be a huge racial disparity. The infant mortality rate for whites was 5.65, for blacks, 13.65. Heart disease continues to be the leading cause of death, accounting for 27 percent of the nation's deaths in 2004. Cancer was second, accounting for about 23 percent, and strokes were third, at 6 percent. The good news: The age-adjusted death rate for all three killers dropped. The heart disease rate declined more than 6 percent, the cancer rate dropped about 3 percent, and the stroke rate about 6.5 percent. The flu season for 2004 was milder than 2003, which helped explain the more than 7 percent drop in the influenza death rate, Minino noted. The death rates for 11 of the 13 other leading causes of death also declined, with only Alzheimer's disease (the No. 7 killer) and high blood pressure and hypertensive renal disease (No. 13) inching up. Improvements in medical care, particularly in heart-disease preventing medications, at least partly explain the improvements in the heart disease death rates, said Ken Thorpe, an Emory professor of health policy. However, Americans continue to have shorter life spans than residents of about two dozen other countries, according to World Health Organization statistics. Japan, Monaco and San Marino have the highest life expectancy, 82 years, in 2004. Australia, Iceland, Italy, Sweden and Switzerland share a life expectancy of 81. Canada, France, Israel, Norway, Spain and the United Kingdom are among the other counties with life expectancies above 78.